Last year, in a given month, close to 100 million unique users visited the top three national portals (as reported by Inman). This is the massive number of consumers eligible to become online leads every month — and yet, what was the number of homes actually sold? Just shy of 5 million in all 12 months of 2014. Yet as an industry, we’re obsessed with lead generation — especially online. Fueled by stats like “90 percent of homebuyers start their search online,” we’ve trumpeted chasing online leads for nearly 20 years. Where is the disconnect? Is this the best we can do? Most real estate professionals who have been exposed to the world of online lead gen must have had a similar inkling that there’s something dysfunctional about lead gen-focused business strategies. Isn’t there something more effective? Something less dehumanizing? Isn’t there something more inherent to the value propositions of brokers and agents than simply churning through as many consumers as possible to sell homes? There is an answer, but it requires a radical rethink of business mantras that we’ve come to accept as gospel in the last decade. You’ve generated more than enough leads. It’s time to generate offers. In a mission to use lead generation as a way to drive as many transactions as possible, we’ve stopped improving and innovating the process of getting our clients to write offers. Worse yet, we’ve gone too far in treating our potential customers as a commodity lead. In order to grow our businesses, are budgets and efforts better spent on buying more leads, or invested directly in helping our clients with their transactions? The answer to me, and to many real estate veterans, is obvious. A strategy that directly focuses on producing more transactions, while providing more value to the client, is far more rewarding, both financially and professionally. “Offer generation,” the strategy of systematically and scalably converting clients into transaction offers, is the direct result of this realization. It will benefit the industry to have the same thought leadership, financial investment and technological innovation garnered by lead gen to be redirected to “offer gen.” We need to focus more on generating offers and less on generating leads. 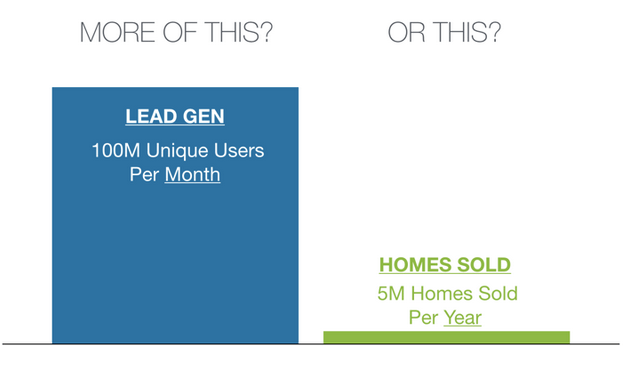 To be clear, offer generation is not a replacement for lead generation. It’s important to continue feeding and maintaining a proven lead gen strategy. With many growth-focused agents and brokers, however, there is a marked overinvestment in lead gen, despite murky ROI (return on investment). By focusing on improving an offer generation strategy, agents can dramatically increase their return on both existing and future lead generation marketing. We also can’t forget that online leads still represent only a small portion of the 5 million closed transactions a year. Inman’s special report on online leads illuminated the fact that for a majority of agents, online leads make up less than 5 percent of their business. 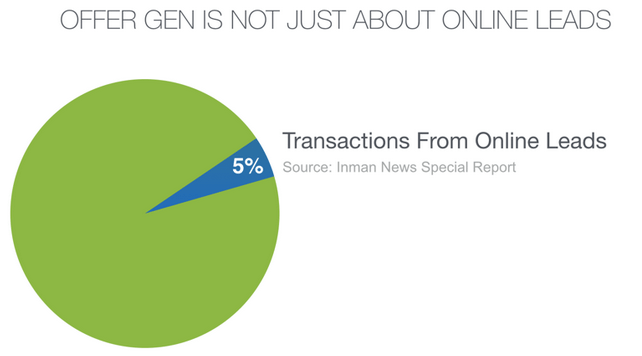 Offer generation is not only about this 5 percent. The other 95 percent of your prospects — the referrals, repeats, walk-ins — also require the attention, investment and technology crucial in converting them into offer-writing clients. Practically, then, how should brokers, agents and other real estate professionals incorporate offer generation in their businesses? Whether the lead comes from online or through an offline channel like referrals, offer generation is about reliably, systematically and scalably converting these leads. 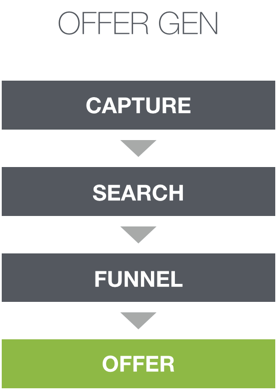 There are three critical elements to this process: capture, search and funnel. Offer gen requires a strong first impression. Despite ubiquitous advice about contacting a lead within minutes, time and technology constraints often prevent agents from putting their best foot forward with new leads. Too often, even legitimate leads are neglected — and therefore wasted. This lead “leakage” is financially painful and is the first thing that must be addressed in a successful offer gen strategy. Successfully capturing a lead is all about demonstrating agent value early in the homebuying process, and the trick is to experiment with tactics that are automated, yet personal. Once a lead is captured and committed, the real work of finding a house begins. Search technology is often dismissed as someone else’s problem, something either the MLS or a national portal can provide to the consumer. Yet consumers very explicitly want their agents, not a third party, to help them find a home, as seen in the National Association of Realtors’ 2014 Profile of Home Buyers and Sellers. It’s clear, therefore, that it is actually the agent’s responsibility to provide the tools and data to help homebuyers find their dream home. Fortunately, agents are in a unique position to compete with experiences provided on public search portals, given access to full and fresh data feeds through MLSs, and more importantly, through rich local expertise. By not taking advantage of this unique position to generate offers, agents are losing transactions that should’ve been theirs. Providing a good search experience is not enough to get the most out of offer generation, however. NAR’s Home Buyer and Seller Generational Trends report showed that a typical buyer needs to physically see 10 homes over 12 weeks to close a transaction. This three-month process drags down the agent transaction cycle, which — without a proper solution –can slow business growth substantially. A good offer generation strategy combats this by setting clear guidelines for how to organize and structure the home search process, by funneling candidate properties through a disciplined decision-making framework. This means properties should be rated, shown and discussed in a way that both agent and client always know what they need to do next. By being structured and action-oriented in vetting available listings, agents can reduce both the number of listings shown and time required to shepherd a buyer into writing offers. We’ve only scratched the surface of how to build a successful offer generation strategy. Fortunately, the real estate technology space is waking up to this new paradigm. Companies are focusing not on selling more leads, but on inherently empowering an agent’s core craft of helping their clients achieve their real estate and financial goals. This is a truly transformative and welcome trend. It’s time for brokers and agents to shift their focus from lead generation and focus on offer generation. It’s a critical step in elevating the value of brokers and agents and delivering the best possible experience to consumers. So go ahead, free yourself from from lead gen — invest in offer gen.